We all know that good skin starts within, and Sonya Dakar’s cocktail of vitamin complexes have been painstakingly developed to supplement the nutritional needs of womankind. Just take the ‘AM’ packet in the morning and the ‘PM’ packet in the afternoon or evening, to boost energy levels, help correct hormone imbalance, enhance bone density and promote healthy, glowing skin. Beverly Hills-based Sonya Dakar is the secret behind Gwyneth's gorgeous glow, as well as being the A-list's go-to guru – tasked with transforming their skin to guarantee they're constantly Red Carpet-ready. 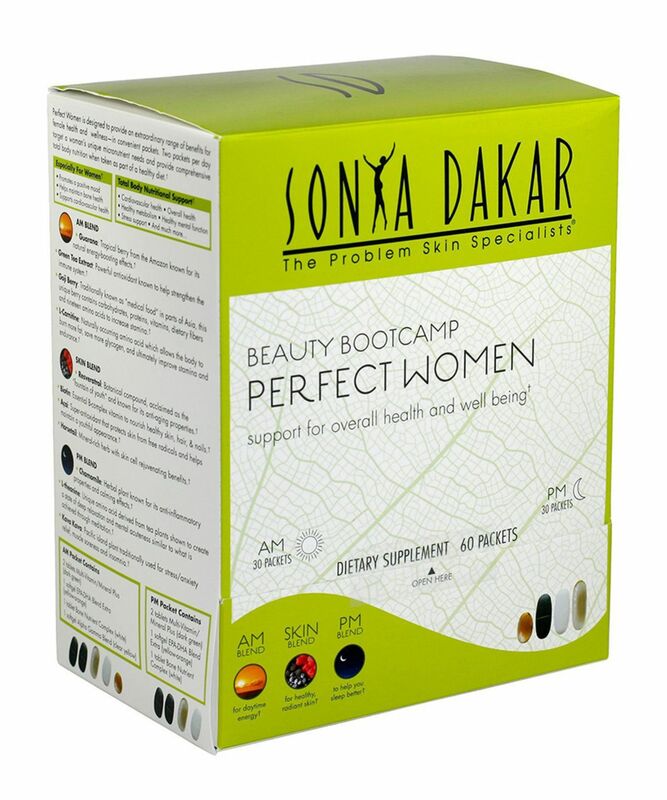 Sonya Dakar’s Perfect Women Multi Vitamin has been developed to ensure you meet your recommended daily dose of vitamins, minerals and the omegas required to maintain optimal health and wellbeing. Tailored towards women’s unique physiology, each daily dosage is brimming with essential fatty acids, calcium, magnesium, iron, vitamin A and vitamin E – all of which are vital for supporting strong bones, regulating hormones and postponing tell-tale signs of ageing. Sub-divided into four, convenient capsules (this ensures optimal bioavailability so your system can absorb the goodness), the ‘AM’ packet is energy- and immunity-boosting, as well as being packed with skin-beneficial nutrients, while the ‘PM’ packet helps to prevent inflammation (one of the primary causes of ageing), and to alleviate anxiety. Take the AM packet in the morning, and the PM packet in the afternoon or evening. The AM packet helps boost your energy and stamina throughout the day, strengthens your immune system and, allows your body to burn fat. It is also packed with nutrients which keep your skin youthful and healthy while nourishing your hair and nails. The PM packet helps to prevent inflammation and alleviate muscle soreness. It also helps you feel relaxed and calm, essential for a good night’s sleep. With vitamins and supplements, one usually has to trust the brand (and the reviews from experts) that the ingredients they are using are good for you. With these total body daily supplements you can really feel a difference after a week. The first thing I noticed two days in to starting this regimen was a lack of hangover after a night on the uber-chilled Sauvignon Blanc - you know the temperature that slips down without you noticing, hmmm. Then I've found that the time of the month was less emo - The Boyfriend's dirty socks on the floor annoyed me less - I felt more in control of my moods and my skin was less reactive. After a month I feel really good, have more energy and the whites of my eyes are clearer. I'm really impressed. If only I could bring myself to a gym bootcamp quite so easily...yeah, not going to happen.